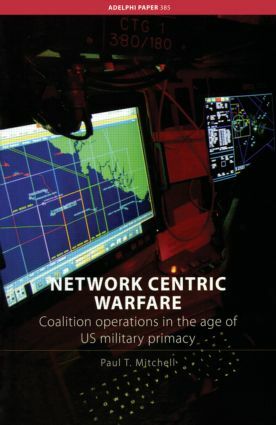 Since its emergence in 1998, the concept of Network Centric Warfare (NCW) has become a central driver behind America’s military ‘transformation’ and seems to offer the possibility of true integration between multinational military formations. Even though NCW, or variations on its themes, has been adopted by most armed services, it is a concept in operational and doctrinal development. It is shaping not only how militaries operate, but, just as importantly, what they are operating with, and potentially altering the strategic landscape. This paper examines how the current military dominance of the US over every other state means that only it has the capacity to sustain military activity on a global scale and that other states participating in US-led coalitions must be prepared to work in an ‘interoperable’ fashion. It explores the application of computer networks to military operations in conjunction with the need to secure a network’s information and to assure that it accurately represents situational reality. Drawing on an examination of how networks affected naval operations in the Persian Gulf during 2002 and 2003 as conducted by America’s Australian and Canadian coalition partners, the paper warns that in seeking allies with the requisite technological capabilities, but also those that it can trust with its information resources, the US may be heading towards a very secure digital trap.